My name is Louise Rastu. 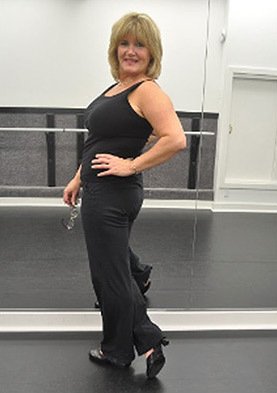 I’m a dance teacher with 40 years experience specializing in tap dance, jazz workout, and ballet/stretch. I offer the best tap dance lessons on Long Island, specifically created for adults. Whether you are new to tap, experienced or somewhere in between, I will have you “shuffling off to Buffalo” in no time. You will learn to dance with confidence, enjoy the “feel of the music” and experience the joy and freedom of expressing yourself, through dance.